In Part 2 of our interview with Haydn Oakley he tells us about getting his first job, the best thing about playing Henri in An American in Paris; and words of wisdom for young performers. Enjoy! And thank you Haydn! I would honestly say getting your first job. There is so much to consider. Half of the problem is to just get a casting director to take a chance on you. Drama school is hard but they look for potential. With a job you have to stand out from the thousands of other recent graduates and get the better of your own nerves too. There is just so much competition. I’m lucky in that I managed to get a casting director who liked me (Pippa Ailion) pretty early on and would always get me in the room. Then it was up to me to perform but it gave me confidence. You have be honest with yourself about your strengths and weaknesses and just keep going in the knowledge that eventually you’ll get that opportunity, and then it’s up to you to work hard and repay the trust shown in you. 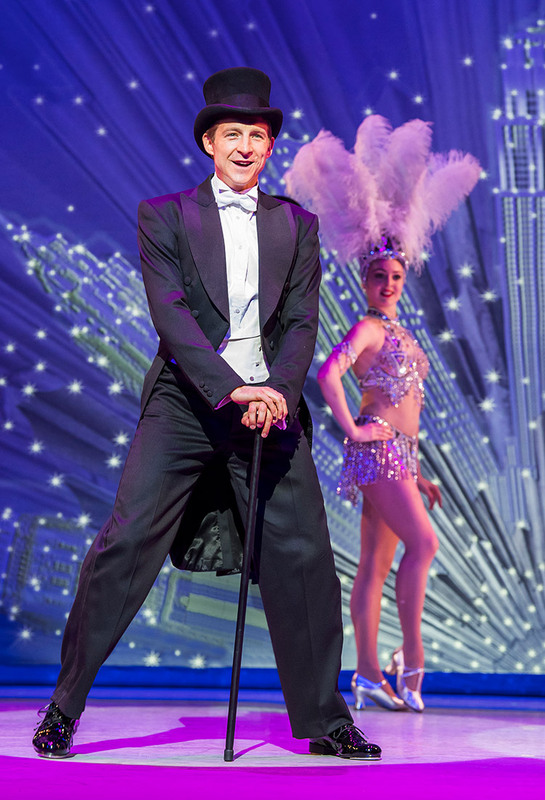 What is the best thing about playing Henri in An American in Paris? I never dreamed I’d get to ‘dance’ like this on the West End Stage. I honestly thought the job would be given to a dancer. I knew I could sing it and act it well enough but expected the movement to be the most important consideration. Therefore I am so grateful for the opportunity that James Orange the casting director has given me here, and for backing me. I love the fact that Henri has been a real challenge for me as a performer. That even now 14 years after graduating I am still learning, still growing, still having to work hard to achieve. His big number ’Stairway to Paradise’ is a dream come true, and I pinch myself every night. I also love the fact I get to work with such a talented cast who make coming to work so enjoyable. I feel very lucky. Looking back on your successful career to date, what words of wisdom can you give to our young performers? Enjoy it! I know performers who suggest you have to LIVE TO ACT! But I’ve always thought you have to enjoy it first and foremost. When you stop enjoying it, your should maybe stop doing it. Also be honest with yourself. Learn from each audition or experience. If you don’t get the part you want then why? Did you forget a line? Or was the other person taller than you? Or even was the audition panel distracted? But try to learn from it and act accordingly next time. We don’t learn from our successes. We learn from our mistakes and disappointments. I didn’t get Henri by being cast in every audition I have ever had, and have failed more times than I have succeeded. Still I have tried to learn from each experience and have confidence in myself through it all.